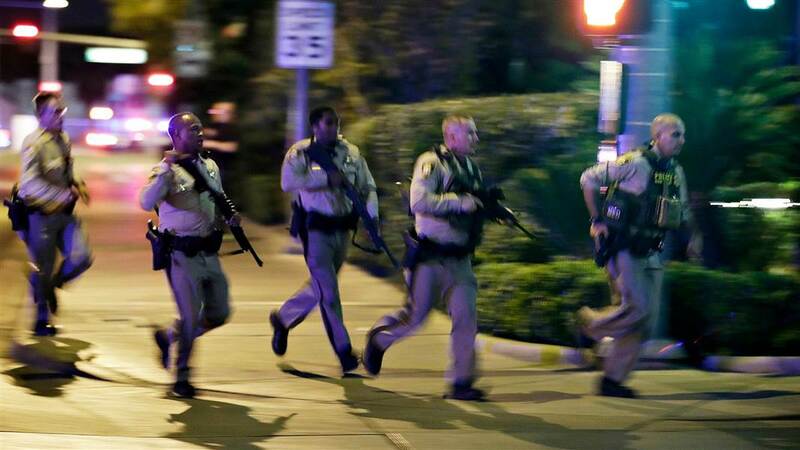 Americans are waking up Monday morning to the tragic news that a mass shooting in Las Vegas has claimed the lives of over 50 people. At least 400 are injured. This is now the largest mass shooting in American history, surpassing both Virginia Tech in 2007 and the Pulse nightclub shooting last year. Lone gunman Stephen Paddock from Mesquite, Nevada was identified as the primary suspect and subsequently killed himself when authorities stormed his hotel room, which overlooked the Harvest country music festival. Israeli news reported earlier that ISIS claimed responsibility for the massacre because Stephen Paddock supposedly converted to Islam some number of months ago, but the FBI has since denied that Paddock had any connection to the terrorist group. Pray for the loved ones of the slain whose lives are now shattered. Pray for the injured, many of whom will never fully recover. Pray for healing and repentance in our country before it's too late. Sounds to me like the beginning of Sorrows that are coming! GOD have mercy on America! Bring us your Peace & Love!!! Right after the 40 days of repentance following the Great American Eclipse! Like I said before...GODs WORD is TRUE!!!!!!! I feel very, very humbled by this and I hope that GOD helped some of those people last night in Las Vegas. May our King come quickly!!!! Its plain for all too see.... Dem's deal in death, NOTHING EVER EVER COMES from the DEM's, theirs is a philosophy of death and FAILURE. to wit: Abortion, Sodomites, anti-gun (a check on gov't rule), anti prayer, anti patriotism, anti GOD, anti individualism (favors socialism), anti free markets.... I can go on and on... The DNC and most RNC is a philosophy of failure..... the only winners in their circle is the GOV't. It's early in the news cycle. Let's pray and leave speculation to others. Still building a firm foundation for gun-control, disarming the nation to be able to control it to the fullest. God's word in action. Even people at my work are talking about how "dumb" it is to allow individuals to own automatic rifles and such. Yet we see the same mass shooting across Europe and elsewhere in the world where the same weapons are illegal. Laws don't stop criminals, they just expose them. 1.) Yes, you can purchase a gun online. But, in that case, you must go through a local, licensed dealer to complete the purchase. For shotguns and such, it's fairly simple, but they ship it to a local dealer who still has to call in, and get you checked a Federal database. 2.) For handguns: It required that I go to the local Sheriff's office. Get fully fingeprinted. Get a background check. Pay for a permit. That's for a handgun. No silencer. No concealed carry. Just a vanilla 9MM handgun. 1.) A Trust/LLC with legal privilege. 3.) Rich as all get-out. I mean, really rich. Like, 75K in your bank account. Because if you are not a weapons dealer, it's really expensive to own such a weapon. 4.) And have the local sheriff sign off. In my jurisdiction, even if you pass the Federal restrictions on the ownership of an automatic weapon, the State still has the right to say "No." This event is 1.) Premeditated. 2.) The work of a WEALTHY individual and previously, law-abiding citizen. and 3.) Unpreventable. It's an outlier. And, in the absence of a religious or supremacist motivation, is probably the work of an individual with a supremely acute mental illness, most likely caused by a brain tumor... ( like the fellow in the Austin Tower Shooting. His family has reported that he was, in fact, extremely weatlhy. But they also said it was so totally out of character. Wonder what snapped in this man. No way this was the job of a single gunman. No way this was the job of a non-marksman 64yo (who joined ISIS BTW, really? ), no way a 64yo man who lives in a Nursing/ Assisted Living Home handled a high powered, fully automatic weapon to kill 59 and wound 500+. Multiple reports say there were multiple shooters from multiple points. Bottomline: the enemy is at work bringing chaos/ anarchy in order to bring about a new order. This and other events past and future will introduce more control, more security, more monitoring, and more surveillance. See the book "Surveillance Society" by the late Grant Jeffery from 2000, we are seeing it come true today: the Rise of the AntiChrist. "The Las Vegas Massacre Is Just The Beginning, But Who's Really Behind It? Do you really think these are just random attacks from crazies? No, these are planned and deliberate attacks by..."
Jesus is still on His way and is coming very soon...Not time to fall asleep. 2 Timothy 3:1 - "This know also, that in the last days perilous times shall come." Still in the "last days" of the Church Age. IMO, the LAST of the last days. Automatic weapons are illegal to buy in the US..one has t o build one or modify a semi auto..
Actually it is not illegal. What you have to do is pay a $200 per item tax, then wait for it to be approved. After that you can purchase the weapon and take it home. The same is true for a silencer. $200 per item tax and an 8-10 month wait for approval. FN is contradicting this article. As of 3 pm mst..we shall see..oh Lord please come soon! I see what you mean. Apparently the Israeli article I linked to was also recently updated to include the FBI's denial. Today my heart is heavy with what happened in Las Vegas overnight. But I know I am to release this notice. And I pray that all who have eyes to see and ears to hear, hear what the Spirit is saying. Saturday I woke from a dream where I was sitting on a wall watching what was taking place in the spirit. But then after I woke I wrote down the dream and began to process it when the Holy Ghost began to show me some things and this is what I saw and heard. When I woke up, I began to hear a song saying, “Jesus will fix it for you”. And then the song changed and I was reminded of a video I’d saved on facebook where a woman was singing another song, “Power” and she was praising God. Then I saw computer tablet and on the tablet I saw a large star falling to earth. Then I could hear someone turning the doorknob on the front door in the spirit so I was taken downstairs and I was shown what it looked like outside. There was ice on the ground and I saw huge balls of ice (hail). And then a person dressed in blue looked up (this was the person who was trying to get in the house but the door was locked) and I saw that the person’s eyes were crooked. Then I heard very clearly, “This is a message from the Lord. This will be a year of black ice”. And then the vision was over. As I sat and pondered what I’d seen the first thing I recognized was that Saturday was the Day of Atonement. The Day of Atonement has many meanings but the first thing I realized was that this notice meant that the judgment has been sealed in heaven for the next year. When I think about the first 2 parts of this vision, I’m reminded of Psalm 91. This morning I woke up around 6:27am after having a dream that once again left me kind of scratching my head. In the dream there were a lot of things going on…so much that I couldn’t make sense of it. I saw a woman but I didn’t know what the significance of seeing her was. And then at the end of the dream I saw I large brown snake crawling away. After laying there for a while I turned on the tv to see what had happened in Las Vegas. I watched it for a while and then fell back to sleep. When I woke up I listened some more to hear that authorities were looking for a woman that the gunman had been in contact with. I realized that was the significance of the woman in my dream. And the snake was letting me know that this is the work of satan. The Holy Ghost has been telling me for a while now that we’re living in a new day. EVERYTHING has changed. This is The Day of the Lord. Wow, powerful dreams and/or visions! i wanna share a dream God revealed to me after all the set dates of the rapture came and went. when Sep 21, 23rd and 30th came and no rapture, i must admit i was feeling very sad and heart broken, i want to be with the Lord Jesus (meet him) so bad that i just cant wait, or focus on anything but him, but after those days past, one night i went out side and looked up in the sky and asked God to come help me, i asked (pleaded) with him to comfort me and show me dreams or something i can just hang on to, something straight from him and not from man's speculation. after i made that short prayer i suddenly felt this great peace and calm in my heart and the spirit of the Lord saying "Im still coming fast". i was so comforted, i smilled and went back in the house. that same night i had a dream, i the dream, i saw a very huge boat (like that of Noah's Ark) outside and its engine was on , then i an Angel of the Lord standing in my room, he had a document in his hand, he was going house by house writing down the final names of the people who were approved to board the ark, the angel started to write my name, my husband and my childrens names down then shouted to us that we should get ready to board the ark and do it fast as its preparing to leave, he then started going house by house and writing names down, but he would skip some houses because those were some of the saints who tured, mocked and scoffed the Lord when the dates of Sep 23 and 30th past by with no rapture, many saints abandoned their faith in God, hence that made God to prune the church to take only the 5 wise virgins from the 5 foolish ones. i then woke up, and the spirit told me, that the dream i had was my confirmation. that Jesus is on his way and is still coming for the church and is at the door, he wanted to see those who trully love him from the bottom of their heart to follow him no matter what, so the true saints have been counted and boarded the ark, any day from now we will hear the voice and trumpet of God. we need to be extra alert in the spirit now more than ever, and look up. then i had a second dream, in that dream i just heard a voice that kept on saying repeatedly " 2017 is the year of the messiah" , . Dear brothers and sisters, Jesus is on his way , and actualy at the door, he promised to take us home hence let stand on that, Heaven and earth shall pass away but hsi word will never pass . Jesus loves you all, and the same way we cant wait to be with him , he is also very excited to be with us. Becs your dream is certainly confirmation. Years ago I used to try to follow dates and what different ones were saying and it led to alot of dissappointments. So as I continued to grow in my relationship with God and the more time I spend with Him I came to realize that if He wants me to know the date He'll tell me. Plain and simple. But He did give us the season. But even if he didn't give us the season I know to just be ready. However I must say that in my 27 years of walking with God, He has never said anything to me about the word rapture. And I've never found the word rapture in the Bible. I'm very aware that men have taken certain scriptures from the Bible and given it a name and have built a doctrine around it. That's a dangerous practice because we've been told explicitly not to add anything or take anything away from his word. So I'm gone leave that right there. So when those dates came I wasn't disappointed at all because the Holy Ghost had already told me what the sign meant. Right now my focus is on being what God want me to be and completing the assignment He has given me. Christ is soon to return but I remember being in a dream where I was at the throne with Dad and Jesus. And I heard Him say "sit right here son until I make your enemies your footstool". And that's where we are now. The Day of The Lord and the return of Christ are two separate but intertwined events. Meaning one event is leading up to the other. Right now the forerunners are rising up with God preparing the way for Christ's return. I'll give you an example. In a dream I was with Donald Sr. We were working together to make sure everything was ready for Donald Jr when he came. I had his clothes and 2 pair of shoes but one pair of the shoes, the boots weren't the right size. I knew he needed a larger size. Donald Jr was still home resting but it was me and Donald Sr working together to make sure everything is ready for him. This is the ministry of the forerunner and this is what the Day of The Lord is about. The totality of the signs, which started last year with the Bible verse from Joel found under the park bench, just cannot be ignored. I know I can't ignore them. The total black sun solar eclipse on Aug. 21, all the blood red moons on Labor Day, the Rev. 12 sign involving the sun, moon and stars (planets). All the anniversaries involving Israel. Israel getting control of the Temple Mount in July. All the 3s and 7s involved. The forces of Ezekiel 38 and 39 already sitting on Israel's northern border. Do not let the fact that we have not been Raptured yet get you down and discouraged. God might very well be watching your attitude and I, for one, do NOT want to disappoint Him. Be grateful to Him at all times no matter what the circumstance is. He said He will come and He will. I have to commend the writers/researchers here at unsealed.org. I have never come across such profound teaching in my life. That goes for Daily Crow, also. You really make me, and I am sure most everybody, think. Thank you for all your diligent work and sharing what you have learned. It is appreciated by more people than you realize. God bless you and your families and this incredible blog. I want to submit this and ask everyone to be praying. As I continue to listen to the news of around Las Vegas, Matthew 24:40-41 keeps coming to my mind. I've read it several times and I believe Jesus is telling us about 2 separate events. In verse 40 he said two will be in the field. One will be taken and one will be left. As I'm reading this I'm saying to myself that it sounds as if Jesus is describing a harvest event. This concert was called I think a harvest concert or harvest festival. What triggered this thought was when I heard a guy on tv saying that he was standing at the concert when suddenly the person in front of him dropped and then the person behind him dropped because they had been shot. Today as I listened they talked about all the weapons, ammunition, and materials he had for a bomb, I'm wondering if his actions are pointing to something more devastating. So I went back to Matthew 24 noticing Jesus describes a second event where 2 women would be at the mill. One would be taken and one would be left. That description sounds like some sort of workplace event, maybe a manufacturing facility. Let's pray and ask the Holy Ghost to reveal the plan of the enemy. QUO, can you open a discussion in the discussion forum for Dreams and Events? I think there's much more here to discuss! @Ned Dibrof, it doesn't really matter which human or what human organization is responsible for Las Vegas. The critical point is that this act was of Satan. Somehow Satan or his demons possessed or influence the shooter to extensively plan and commit an unspeakable act of evil. Even if the act was committed by a group of people (Not saying that it was. I don't know.) the power and the influence behind it was Satan. As soon as we forget Paul's warning in Ephesians 6:12 and we think the fight is against humans we have missed the most important lesson to learn from this tragedy. FYI to all...Paddock is the name of the toad demon that calls the witches away in the first scene from Shakespeare's "Macbeth"! will remain in the shadow of the Almighty. 9 You, O Lord, are my refuge! Did I mention That This Happens the next day after Yom kippur?After the 40 days for repentance? This single gunman story being fashioned by the news media and law enforcement does not seem plausible to me. I can't believe a 64 year old "accountant" was able to pull off a "Jason Bourne" level sophisticated attack without detection. Where did he get these guns that are already illegal? I have yet to see any video of this man making multiple trips carrying long rifles and literally 100's of pounds of ammunition up to his room in a hotel loaded with surveillance cameras. There are videos out there showing flash fire from both the 4th floor and 34th floor. There is a video of a taxi driver shooting a 13 minute clip that sounds like two guns firing at the same time. The whole thing seems fishy to me and if this is a false flag event it fits perfectly in with an end times one world government and the confiscation of our fire arms and second amendment rights. Many may not know that guns are completely illegal in Mexico for the average citizen. In fact the only folks in Mexico with guns are the drug cartels and gangs. people live in complete and total fear there because they have no means to defend themselves from these vicious criminals. The days are evil surely. Lord Jesus we pray and trust you are coming soon for your bride from this evil evil world. .......and, in addition to all the incredible signs the Lord has given, how can one deny all the personal signs given to believers who ask God to confirm these Great Events, such as the Eclipse and Rev. Sign. As one who has been disappointed over Sept. 23 not happening, this past Monday, Oct. 2, out of the blue, as I was walking my dogs, I started singing a song from many years ago, a secular song, which I have not sung any such songs since I was saved 40yrs, ago, called "They'll Be Some Changes Made", probably from a real old movie in my teenage years (I am now 79). Here are the words as I remember them: "They'll be a change in the weather and a change in the sea - from now on they'll be a change in me. My walk will be different, my talk and my name - nothing about me's gonna' be the same. Gonna' change my way of livin' and if that ain't enough, I'm gonna' change the way I strut my stuff. No time to do it when you're old and grey. I'm gonna' change my way today, I' m gonna' change my way". Silly song, but it sure seems like a personal witness to me from the Lord that He is still coming soon. I' m thinking "we shall not all die, but we shall be CHANGED......". God does have a sense of humor, you know. He gave me a "Change" song, just sayin'. Maranatha. I've just been reading about a security guard who, even though he was unarmed, risked his life to stop that madman. The guard was shot in the leg but still did everything he could to help the police, until they finally sent him to get care. Interestingly enough, the guard's name was Jesus. May God Bless those who have given support. May God Bless those who have risk their lives to save others. May God bless each of you to draw near to Him in these last days. In Jesus Name! I remember when former DHS Secretary John Kelly said on Fox News that if we knew what he knows about terrorism, we would never leave the house. That's why I'm on the couch under my blankie with my cats somewhere close by about to study my Bible, take a nap, and watch Mad Max later.